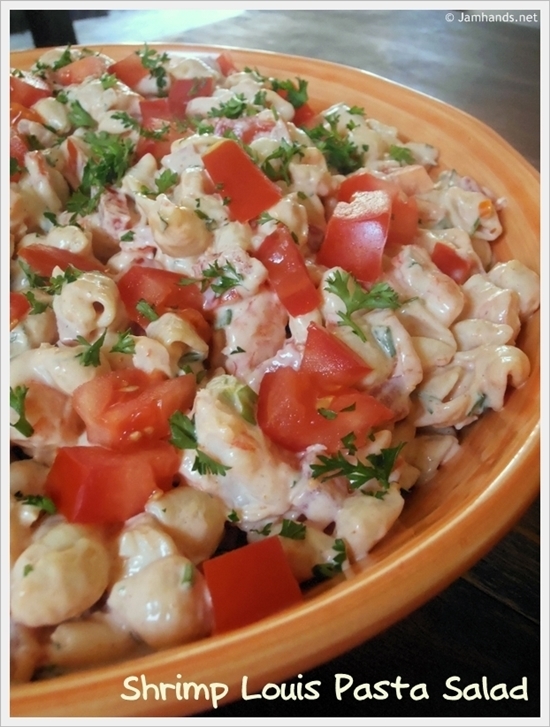 Today I'm bringing you my favorite pasta salad recipe, Shrimp Louis Pasta Salad. I made this last summer for Jack's first birthday and I absolutely loved it. It is important to let the finished pasta salad chill for a few hours to let the flavor develop. It really makes a big difference in flavor. Some reviewers reported that they thought there was too much sauce in this dish, but I thought it was just right. If you have leftovers, the sauce tends to be absorbed even more into the pasta a day after preparing. If this is a worry to you, increase the amount of pasta by just a bit. 1. Cook pasta according to package directions; drain. Rinse with cold water to cool quickly; drain well. 2. Meanwhile, in a large bowl, whisk together mayonnaise, ranch dressing, seafood cocktail sauce, lemon juice, Worcestershire sauce and salt & pepper. 3. Stir in cooled pasta and remaining ingredients. Let it chill in the fridge for a few hours to let the flavors develop. This looks really good but I just hate the taste of peppers. Red, green, yellow, orange, hot, or mild, I can't stand them. Is there any thing I can substitute for peppers in all these wonderful recipes that i would like to try? That salad sounds delicious and the photo is so tempting! This is a recipe I need to make! Looks so good can't have enough pasta recipes!